Gladwyne, with its village atmosphere, luxury estates, and safe streets, is one of the most prestigious and sought-after neighborhoods on the Main Line. It is also one of the wealthiest, with the 14th highest per-capita income in the country. Gladwyne Homes Stone houses and mills grew up along Mill Creek. Some of these still exist today and have benefited from restoration, others stand crumbling, in ruin. This is now the Mill Creek Historic District, listed on the National Register of Historic Places. Grand estates and sprawling mansions were built after the Civil War. Attached townhouses appeared in the 1970s, followed by condominiums in the 1980s. Fortunately, many of Gladwyne’s luxury estates and grand mansions still stand, a testament to the town’s continued prestige and exclusivity. Famous People Gen. Henry H. “Hap” Arnold was born in Gladwyne, attended Lower Merion High School, graduated from West Point, and became a five-star general of the air force during World War II. J. Presper “Pres” Eckert invented the first digital computer, ENIAC (Electronic Numerical Integrator and Calculator). M. Night Shyamalan, noted director of popular films, lived in Gladwyne for years but recently moved to Willistown Township. The Philadelphia 76ers Alan Iverson, Kyler Korver, Chris Webber, Eric Snow, and Dikembe Mtumbo have all lived here. Clifton Wynyates, a large Tudor estate formerly on 192 acres overlooking Mill Creek, has been owned by talk show host Mike Douglas and R&B singer Teddy Pendergrass. Shopping & Dining Because of its small size, Gladwyne is primarily residential. Still, the little village is not without retail delights. It is well known for the Delaware Market House, a specialty food store. The Merion Square Hotel still stands, functioning now as one of the Philadelphia area’s finest restaurants, the Guard House Inn. Recreation In keeping with the English country lifestyle that early Main Liners sought to emulate, horses are, and have always been, important in Gladwyne. The Bridlewild Trails Association, begun in 1927 by a group of property owners, still maintains a membership of families who participate in riding or walking the more than thirty miles of marked trails. The Philadelphia Country Club opened in 1927, combining three large tracts to achieve a total of 294 acres. 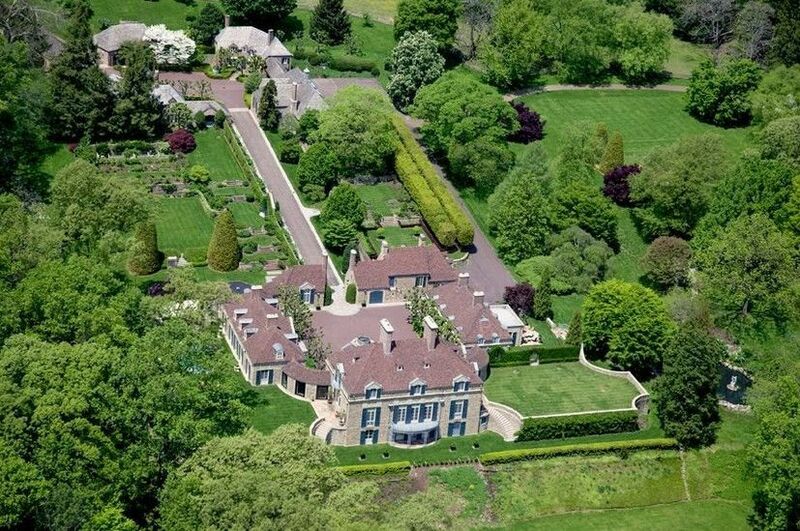 Industrialist James Crosby Brown of the Pennsylvania Railroad built a 185-acre estate that, after his death, was divided into non-divisible 3 to 17 acre estates and palatial mansions along what is now Crosby Brown Rd. This early act of preservation set an important precedent for protecting the environment and rural setting of the area, a precedent which has been staunchly followed ever since. Land acquisition and preservation has resulted in numerous parks, playgrounds, and nature centers: Kenealy Nature Park, 87 acres; Gladwyne Playground (W. A. L. Barker Park), 13.10 acres; Henry Lane Park, 18.70 acres; Mill Creek Valley Park, 88.54 acres; West Mill Creek Park, 9.59 acres; and Flat Rock Park, 15.29 acres.